Millions of us enjoy warm weather every year by swimming in our backyard pools and relaxing in hot tubs. 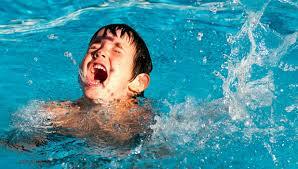 Tragically though, over 600 young children drown in backyard swimming pools each year in South Africa. With summer well on its way, it is important to make sure your swimming pool is safe. Secure your pool with appropriate barriers. Completely surround your pool with a 2 m high fence or barrier with a self-closing, self-latching gate. Place a safety cover on the pool or hot tub when not in use and remove any ladders or steps used for access. Consider installing a pool alarm that goes off if anyone enters the pool. Keep children under active supervision at all times. Stay in arm’s reach of young kids. Designate a responsible person to watch the water when people are in the pool—never allow anyone to swim alone. Have young or inexperienced swimmers wear swimming aids. Ensure everyone in the home knows how to swim well by enrolling them in age-appropriate water orientation and learn-to-swim course. Ensure everyone in the home knows how to respond to aquatic emergencies by having appropriate safety equipment and taking water safety, first aid and CPR courses from Life Med Ambulance Service’s Training Academy. This article is meant to be used as a guideline. It is important for parents and caretakers to learn CPR and how to do it correctly. Below are some tips on what to do if you find your child drowning. If you are alone, follow the steps below before stopping to call 0861 086 911. If you are not alone, while you start the steps below, ask someone to call 0861 086 911. See whether the child is breathing. Place your ear near the child’s mouth and nose. Do you feel air on your cheek? Is the child’s chest moving? (Gasping is not breathing.) While checking for breathing, you can also call the child’s name to see if the child responds. You do not need to remove water from the child’s throat to start CPR. Tilt the child’s head back and lift the chin. If you suspect a neck injury, do not tilt the head, just open the jaw. For a baby, be careful not to tilt the head back too far. With an infant, place your mouth over the baby’s nose and mouth to form a tight seal. With an older child, pinch the nose closed and put your mouth over the child’s mouth, forming a tight seal. Blow into the child’s mouth for 1 second. The child’s chest should rise when you do this.